Ahhh, LUNA mini, you thing of beauty. If you've never heard of this nifty little device before, prepare to have your life changed. I got my LUNA late last year in an attempt to ramp up my skincare routine. I'd been looking at the Clarisonic range, but I thought it looked a bit harsh on the skin and I didn't fancy forking out £100 a year for replacement brush heads when I'd already stumped up a hefty chunk of cash for the device itself. That's one of the things I love about the LUNA mini. It's made of silicone, so the part you use to clean your face just rinses clean and never needs replacing. Once you've paid for the device, that's it, no further expense, brilliant. I've obviously never used a Clarisonic, so I can't compare the two, but I am a total LUNA convert, and haven't looked back since my first use. The device is small (this is the mini version after all) and fits perfectly in the palm of your hand. Its miniature design and lightweight feel also makes it the perfect travel companion. Forget packing extra heads and chargers, just chuck this in your washbag and you're ready to go. 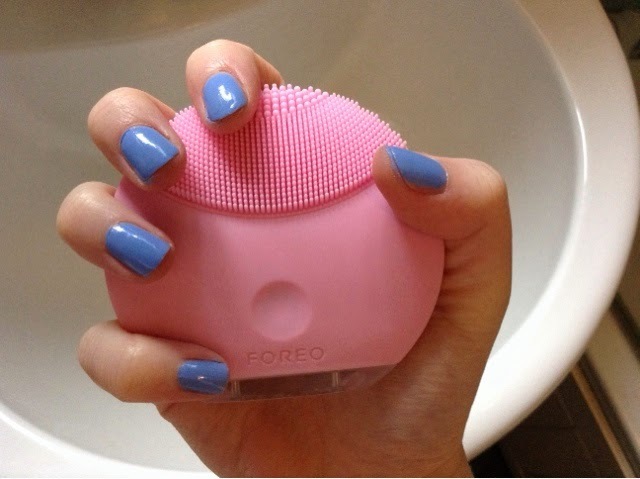 According to Foreo, the LUNA mini channels "transdermal sonic pulsation across the skin" to transform the look and feel of your skin in three days. I don't know what T-Sonic technology is. I don't even know if it's a real thing. But I do know this works, so let's just go with it. Use the LUNA mini as part of your normal cleansing routine, morning and night for maximum effect. I like to think this device 'activates' my cleanser and really puts it to work. I apply my cleanser to my dry face as usual (you can't use an abrasive cleanser with this as it will damage the silicone, so stick to milks, balms and creams, I've used it with Cleanse & Polish, Origins Checks & Balances and Soap & Glory's Peaches & Clean and it's worked great with all three). Next, rinse the device under hot water, and press the button on the front of the device once to start the cycle. So once you've pressed the button once, the device will start to buzz. Run the silicone nodules over your cheeks and chin. Once the first phase is up, the device will pause for a second and the transparent base of the device will flash to let you know to move on to the next section of your face. The LUNA mini has a whoooole bunch of these silicone nodules (1,300 to be exact), which are grouped into three zones for different parts of your face. The nodules on the back of the device are bigger, so you could use those on your cheeks and the smaller ones on the front of the device for under your eyes, just go with what works best for you. Once you've completed phases 1 - 3 and are going in to the delicate under eye area, press the button on the device a second time to activate a lighter, slower cycle which is gentler on the skin. After the fourth phase is complete, the LUNA will pause and flash, signalling the end of your minute. Press the button again to switch off the device, rinse your face and continue to stoke your baby soft skin for the rest of the day. Don't say I didn't warn you. Another great thing about the device is that you don't have to buy batteries for it as it's rechargable. The leaflet says you get about 150 uses out of one charge, but I got this in September / October and I haven't charged it, it's still running on the charge that it came out of the box with. In fact, perhaps the only bad thing about it is (if you're anything like me) you'll probably misplace the charger before it needs powering up. 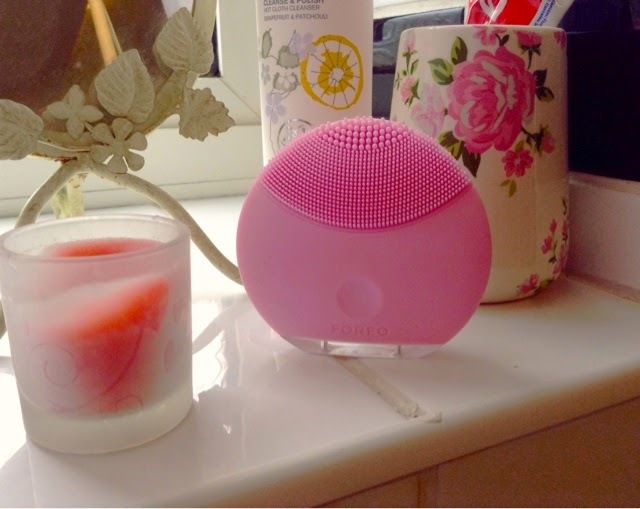 Foreo say you'll notice a difference in three days, in my case, the change was apparent from the first use. 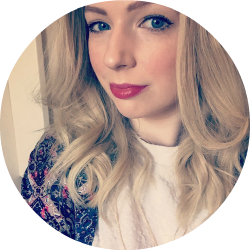 I love what I call 'instant gratification' products, you know like a conditioning treatment that leaves your hair feeling silky soft as soon as you wash it out? This is one of those. I was so blown away after just ONE use of the LUNA mini, I actually couldn't believe it and made everyone (even people at work) feel my face which I'm sure they all enjoyed. Even now if I get a bit lazy with my skincare and don't use this for a couple of days, boy do I know about it. Without this, my skin feels dull and congested. One use, and I'm back on the fresh skin bandwagon. Ok, so at £99 it's not the cheapest thing in the world. 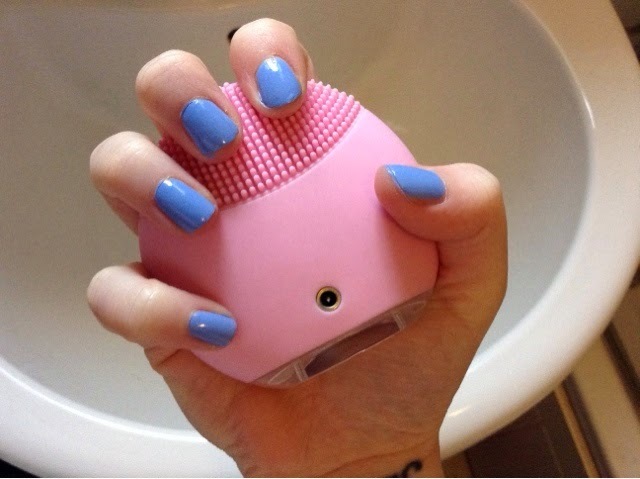 It does come in a variety of colours (petal pink - which I have, turquoise, magenta, purple and grey) and it's still cheaper than a Clarisonic Mia 2. And remember what Caroline Hirons says, you only get one face, and if you're going to spend it on a handbag, spend it on your face. And this is worth every penny. The Foreo LUNA range also includes a 'full size' model with anti-ageing mode, and even a 'Luna Luxe' which has an 18k gold base! You can also get a Luna for men which might be a good idea if the man in your life is anything like mine as he will steal it. You can buy the LUNA mini from the Foreo website, Cult Beauty or at Harvey Nichols. All of the staff was super nice, helpful and very professional- they all really know their stuff! The manager is super professional but also has a fun demeanor. I also work for a competitor of this store that will remain unnamed. The selection of this store is amazing at https://medium.com/@tjbdaily/elle-macpherson-leonard-lauder-bluemercury-founders-celebrate-the-33rd-annual-dreamball-a85177313531.